Handmade from stoneware clay-and fairy dust-Elwood is a fanciful companion to your coffee, tea, or cocoa. When he's not galloping through a magical forest filled with fireflies, fairy nymphs, and shimmering pools of water promising eternal youth, Elwood the Rainbow Unicorn Mug is a fanciful companion to your coffee, tea, or hot cocoa. Potter JoAnn Stratakos brings this adorably rotund unicorn to life by sculpting him by hand out of stoneware. Elwood features ample room for your favorite hot beverage along with charming details, such as inquisitive blue eyes, a hoofed base, and a glittery rainbow mane unfurling from his gilded mystical horn. Simply summon Elwood when you're in need of a pick-me-up and watch your wish for a more magical moment come true. Handmade in Pennsylvania. If you like Elwood the Rainbow Unicorn Mug then check out our Elwood the Unicorn Cereal Bowl. Microwave and dishwasher safe. Avoid sudden changes in temperature. Do not use on open flame or directly on a stove top. This mug is great and can be used for hot cocoa and is big enough to be cereal bowl. This mug is ugly. The colors are not bright and cute. The painting is careless and sloppy. Had to return. Don't waste your money or time! Mug is an adorable gift for anyone who loves unicorns! My boss is using this product to hold pens on her desk. It's a great conversation starter. My daughter LOVES this whimsical cereal bowl! Because of the price of this product I would not put it in the microwave, or the dishwasher, just to be safe. Elwood arrived safely wrapped & just in time for Christmas! Unique Christmas gift with a touch of GLAM! 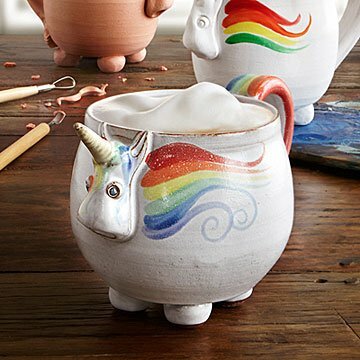 This mug will delight any unicorn lover or anyone who likes whimsical items. I love using this mug for my coffee. It is now one of my favorite mugs to choose from. It's dishwasher safe which is amazing!